This recipe for Homemade Apple Pie Larabars is super simple and incredibly delicious – it requires no baking, and it’s the perfect gluten-free, Paleo, vegan, and Whole30-friendly snack. 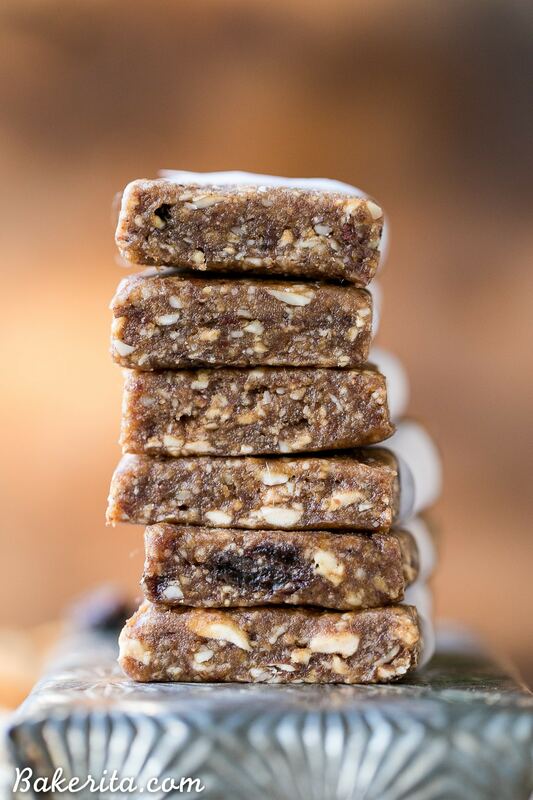 These Whole30 Larabars will become a quick favorite! Finally, I’m sharing a Whole30-friendly recipe with you guys! I’ve actually made quite a few of them while I’ve been prepping and on my Whole30 journey, but I wanted to share some other stuff first. But now – they’re coming! Starting with one of my newest favorites for healthy snacking – a Larabar copycat, in the best possible flavor…Apple Pie! I grabbed a few Larabars at the grocery store when I was buying some snacks for my Cuba trip and Apple Pie was one of the flavors I grabbed. I was instantly in love and needed to recreate. 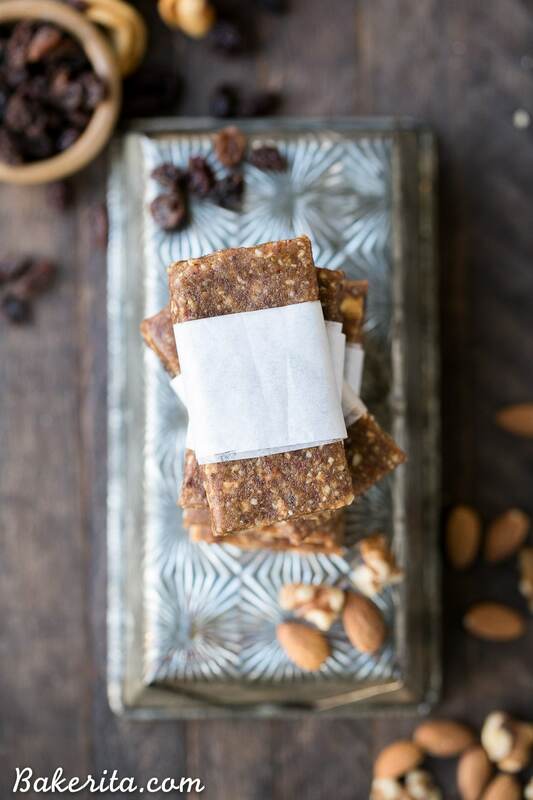 I ended up hungrily devouring it one day of our trip, and immediately grabbed a notebook and scribbled down a copycat recipe based on the super simple and minimal ingredients in the bar. I was in love with the sweet flavors, crunchy bits, and the hint of spice, and need to have these on hand at home. Turns out, these are allowed on my Whole30 journey (as long as I don’t eat them as dessert), so I made them pretty much as soon as I got back home. Holy cow, they’re so darned delicious! Why hadn’t I made these whole30 Larabars before?! These Apple Pie LaraBars have a base of Medjool dates, which makes them sticky, sweet, and helps them bind together. 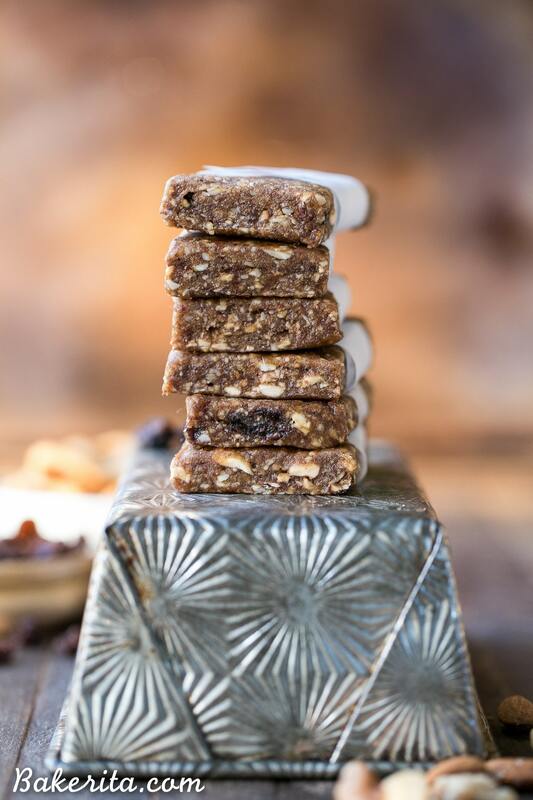 They’re loaded with almonds, walnuts, raisins, and dried apples to add chew, crunch, and a whole lot of delicious flavor. A little cinnamon is in there too, to add some extra depth and warmth. 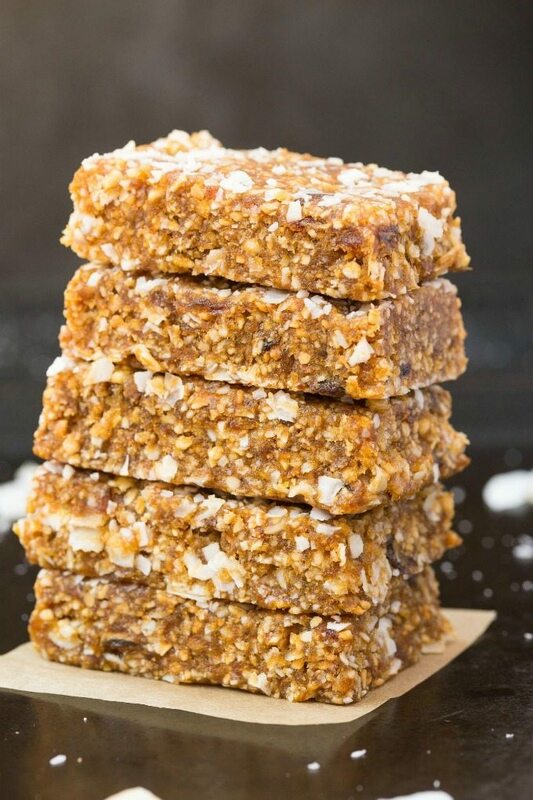 These Whole30 Larabar snack bars come together quickly in a food processor and high-powdered blender – I used my Vitamix because I don’t have a food processor, but a food processor would definitely work better here, so I’d recommend using that if you have one. If your blender isn’t super high powered though, don’t use it – it will burn out quickly because it’s a very thick, stiff dough. Once all the ingredients for the whole30 Larabars are pulsed together and have formed a sticky, thick dough, you’re pretty much done. I didn’t even use a pan to shape the bars – I simply put the dough in between some sheets of parchment, formed it into a rough rectangle and flattened it out with a rolling pin. 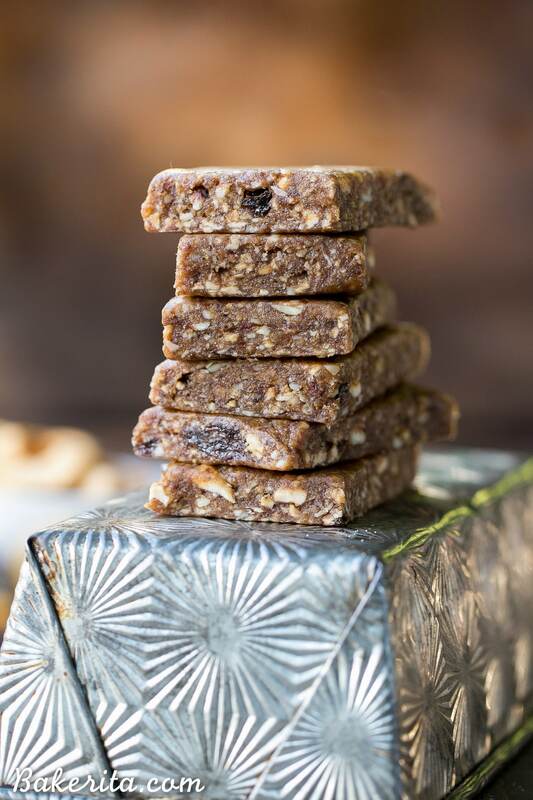 I sliced the dough into 6 bars for the photos, each about the size of a store-bought Larabar, but I ended up cutting each of those in half to snack on, since the whole bar was pretty filling and I was using them as snacks, not a meal replacement or anything. 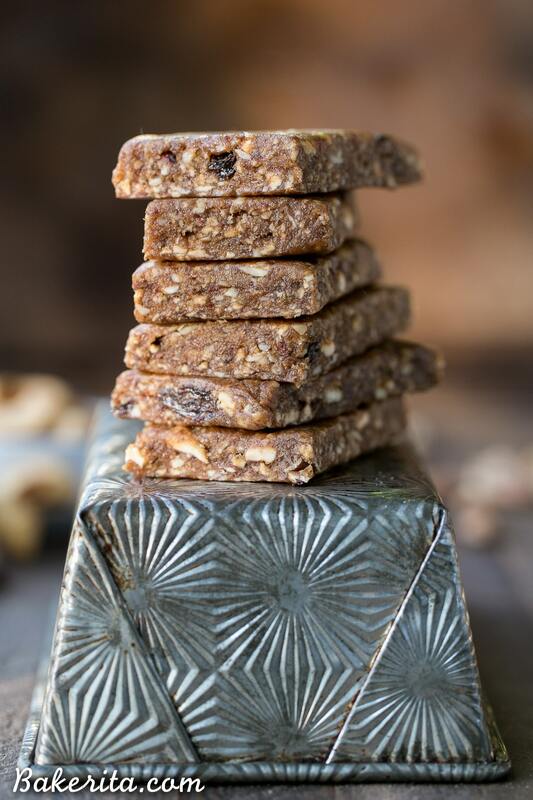 They’re the perfect pick me up and even make a good on-the-go breakfast bar! Add the dates to a food processor or high-powered blender (I used my Vitamix) and blend until they’re broken up. Add the dried apples, raisins, almonds, walnuts, and cinnamon. Pulse until combined - there should be small bits of nuts and raisins remaining, but not too big. Be careful not to over-process so it doesn’t get too sticky or greasy. Store in a sealed bag or small lidded container in the fridge for up to a month, or in the freezer for long-term storage. Want more Whole30 Larabar recipes?! It’s been a while since I’ve had a larabar, but I do remember loving them! So creative that you made your own Whole30 version! Love the apple pie flavor…sounds like the perfect snack! It really is! Having a go-to snack on Whole30 makes it sooo much easier. Thanks Gayle! Apple pie energy bar? Oh yes please. I love apple desserts but rarely allow myself to have them because I lose all self control. But these would totally keep me on track. ps I love that loaf pan! I’m the same way with apple desserts! I eat the whole thing, haha. These are the perfect small treat to satisfy the craving. Thanks Annie! The loaf pan is one of my faves too – it’s an Ovenex I found at a vintage market near me. I’ve had Larabars before and I have to say that these look even better! I love the apple pie flavor here and I need to get out my Vitamix and whip up a batch stat! , but I am wondering if these might be better?? And you are too humble to tell us :) Peanut butter chocolate chip is my favorite Larabar. I would love a recipe for it. Hi Kellie, these are super similar to the Apple Pie Larabars because they use the same ingredients! So you might not love these either, but I’ll definitely test out a recipe for the Peanut Butter Chocolate Chip Larabar, because I love that flavor too :) thanks for the suggestion. I’m in the last week of my Whole 30 so this is perfect timing! Yahoo! These are no bake? Wow they look amazing! Need to try these! What a perfect way to get my Larabar fix – these look so delish! Thanks Laura – they’re so delicious! I haven’t tried either of those flavors! They’re going on my list of ones I need to try :) thanks Ashley! You know I’m all about grab and go snackin, Rachel! These are SO fabulous and packed with all the good things I love. 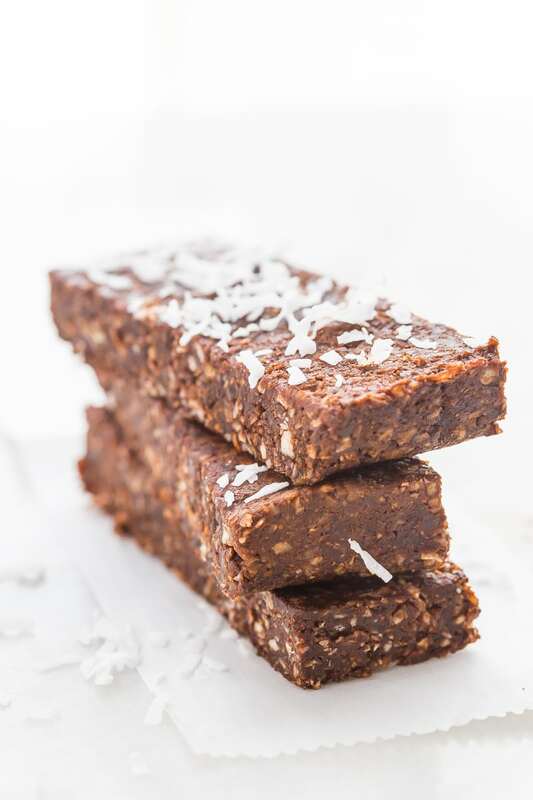 Dates make a perfect base for snack bars because they’re sweet AND sticky! Natures candy! Thank you for sharing and all the best to you as you continue on whole30! Dates are certainly nature’s candy – they’re so good! Thanks so much for the love and well wishes, Traci. Hi! thanks so much for the larabar recipes! Wondering if you have since tried the blueberry muffin bar? It’s one of my favorites, but, since it has vanilla extract (assuming this is the reason/ingredient) it’s not Whole 30 approved. Have you tinkered with making a recipe for them, minus the vanilla extract maybe?? 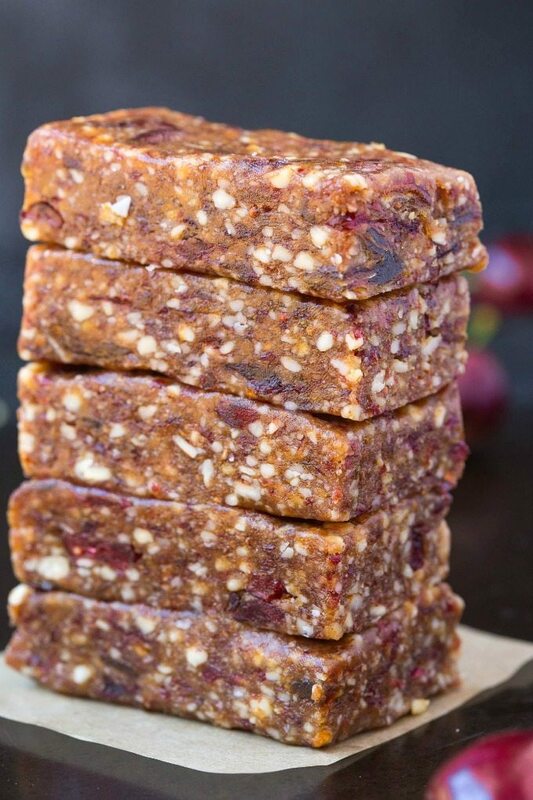 Would also be interested in the cherry tart bar, it’s my second favorite! I’m intrigued by the pineapple upside down one mentioned by a previous reply! Hi Amanda, I actually haven’t tried the blueberry muffin flavor but I just checked it out on the website and it looks so delicious! I can definitely put it on my to-do list to get that one recreated, along with the others you mentioned. For a Whole30 vanilla alternative though, I’d recommend getting some vanilla bean powder! You can use it wherever you use extract, but since there’s no alcohol, it’s approved. Hope this helps! I just made these and they are delicious! The mix wasn’t sticky enough to form into bars so I re-blitzed it with a couple of tablespoons of water and that did the trick. Thanks for the great recipe! Thanks so much for the feedback, Monika! So glad you’re enjoying them. Where can I find the nutritional values for your recipes? Thank you. Hi Audrey, you can calculate the nutritional info for any of my recipes by inserting the post link here: http://www.myfitnesspal.com/recipe_parser. Hope this helps! Do you think we could use dried dates? Sure, I’d just rehydrate them for a bit in some hot water first! Oops yes, it should be 1/2 cup! I used deglet dates this time instead of medjool because that’s all Costco had. They were just as good!